What Are Renewable Energy Certificates (REC)? Renewable Energy Certificates (REC) are tradable (non-tangible) energy commodities that represent the property rights to the environmental, social and other nonpower qualities of green (renewable) electricity generation, measured in units of one (1) Megawatt-hour. In other words, a REC represents the proof of one MWh of renewably-generated electricity. A REC (and its associated environmental benefits) can be sold separately from the physical electricity that it is associated with. Certified renewable electricity generation facilities are credited with one REC for every Megawatt-hour of elecricity they inject into the grid. These REC are issued by a certifying agency, and given a unique number that allows them to be tracked. Certification is an important aspect of the REC system. In most cases a renewable energy generation facility must be certified in order to be issued REC. The REC themselves are most often certified and tracked by a third party as well. Certification for REC in Canada is usually through the EcoLogo label, and most energy marketers use well-established auditors such as Deloitte or Ernst and Young to track their sales of REC. Find out more about EcoLogo in Canada. Purchasing a REC is not the same as purchasing the renewable energy itself. 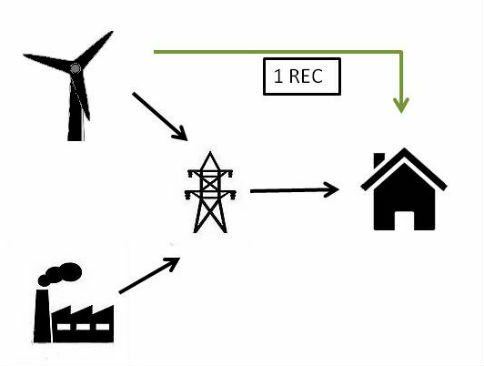 In many cases a REC purchaser will not be connected to the same electricity grid as the one into which the associated physical electricity was injected. However, a REC purchaser can claim to have "offset" their carbon emissions, by their purchase of the benefits of an REC. Purchasing renewable energy certificates is first and foremost a way of supporting renewable energy generation, as it provides an additional source of income to green electricity generators. They can use this money to reinvest into further renewable energy generation. It also allows you to "green" your energy consumption, which is useful if it is not possible for you to purchase green electricity directly. Unless you are able to install your own renewable energy capacity, you will be consuming energy from the grid, which - depending on where you live - may come from sources that are more "brown" than "green". Purchasing REC allows you to offset the emissions associated with your energy consumption. Renewable energy certificates can range in price, depending on the location and type of renewable resource, with a "national renewable blend" product at the lowest cost, and REC associated with a specific technology or region gaining higher prices. In general it is a good idea to make sure that the REC that you are purchasing are certified. Certification indicates that the energy source meets certain standards for resource content and environmental impact, and that the REC is being tracked and used in the way that it was intended. As REC are not bound by geography, you may also want to consider choosing a contract that allows you to purchase REC that are locally (or nationally) produced. While MWh of energy does not change in value if it was produced 10 km or 1000 km from your home, supporting locally-produced green energy can help to increase green energy generation capacity in your province, and hopefully contribute towards it gaining a larger share of your province's energy mix. Interested in learning more about green energy in Canada? Find out more about green energy in Alberta and green energy in Ontario.